Strangely enough, I have a pool. I live in Brooklyn, in an apartment, but I have a 10 foot by 8 foot above-ground pool sitting in my garden. We didn’t put it in, the folks we rent from did. And although it’s a nice little extra—especially with kids—it’s also a bit of a pain to take care of. So this year, as we prepared to “open” our little urban oasis for the season, we got a new gadget to help clean it up. The iRobot Verro 100 ($400) pool cleaner is exactly what it sounds like, a robot that cleans your pool. It’s easy to set-up, not too heavy to carry and, best of all, it does all the work for you. The Verro includes a self-contained vacuum, pump and filter system which picks up all kinds of crud—like hair, pollen, algae and bacteria. And trust me, in the middle of Brooklyn, we need all the help we can get. Who knows what’s gotten in there over the winter! There’s no attached hoses or pumps, you literally plug it in to the nearest electric outlet and drop it in the pool. You can walk away and let it do its thing, no need to stand around and watch (though my three year old son totally did. He named it Wall-e). We used the Verro 100, which is made specifically for above ground pools. Once it’s in the pool, it cleans the entire thing in about 90 minutes by sort of moving back and forth on its thick, rubber wheels in one spot until it’s clean and then moving on to another area. It also circulates about 70 gallons of water a minute and promises to remove debris down to two microns. I can’t vouch for that (since you can’t see that kind of dirt with the human eye), but I can assure you that my pool is the cleanest I have ever seen it. Our one problem was that one of the wheels kept coming off. It was easy enough to stick back on—and when we looked at the manual, iRobot was classy enough to suggest that this does happen and it wasn’t something we did. So, although we did have to check on it a few times, it wasn’t a deal breaker. The 40-foot power cable is a good length and comes with a swiveling detangler just in case. Check out www.irobot.com for more information or Buy Now. For a $400 gadget it’s unacceptable that a wheel keeps coming off - did you try contacting the company about it? Lately these cute little iRobot pool cleaners have been very popular among swimming pool owners, since it’s hard to find something that can surpass their effectiveness. Still the price is a bit stingy, so hopefully it will soon go down and the cleaners will be more affordable. I’ve had a similar “Robot” product for my inground pool for 10 years. I paid almost $800 for it and the replacement cost is still about the same. I would replace it in a heartbeat! It has saved me many thousands of dollars over the years and I have the cleanest pool I’ve seen. Spend the money - It’s the best purchase you can make if you want to maintain your own pool. You forgot to mention that it also saves on chemical bills since it circulates chlorine and powders that may be have settled to the bottom and also you are not using your filter to clean the pool which saves water due to less frequently needing to backwash a clogged filter. This robot is an affordable gadget but is it effect just for above ground pools? What about inground pools? These are usually wider, did anyone had any experience with using the “wall-e” on wider pools? At the moment I have a clogged filter and I can’t use the pool, I am thinking to replace it with a type a pool filter and then get the robot and see how it works. $400 is an affordable investment. Heading into summer now and I promise to never neglect my pool the way I did this winter. I just bought a “wall-e” too. I was sold on the 300 HydroJet and I must say so far I am in awe. I can’t believe how fast and effective this little guy is. You are all correct. Robotic swimming pool cleaners, such as the Aquabots and iRobot Verro models do save money on chemicals (up to 30% in fact) and time (however you quantify that from a cost perspective). Working without hoses, your pool’s filter or costly-to-run energy draining booster pumps, robotic cleaners plug into a power supply (AKA step-down transformer) that plugs into your outdoor grounded outlet. By pressing a button or if plugged into a separate auto on-off timing system, such as a house timer or pool control system, your roboot will work automatically (external timer operable feature is not standard on all models). These robots will also filter your water as much as 10 times finer than what many main pool filtration systems can do, including remove piles of leaves, twigs, pine needles and even difficult sand, silt, pollen and algae. They are up to 30 times more energy efficient than traditional pool cleaners, saving their owners in some parts of the country upwards of $2,500 per year in energy alone, and some models can clean pools as fast as 1 mere hour. That includes in ground pools. That thing looks pretty cool, but I do agree that the price is a little steep. I suppose if you invest in a pool, it’s a wise move to take immaculate care of it. BTW, I’d love to see what a swimming pool in the garden of a Brooklyn apartment building looks like, lol. I’ve seen these gadgets in pools around my neighborhood, they are really cool. You sure do look like you have a nice pool. We’re thinking about getting a pool as well, except we’re thinking about going underground. So we can do some diving. This is a gadget like no other. It’s amazing how it works. I am a plumber in Bakersfield and I’ve had the opportunity to service a few customers who have this gadget. I definitely like the way it works. Since you’ll have to empty the pool, in order to make it accessible for this robot, it’s not that efficient. Above ground pool covers and an intex filter would do the job without emptying the pool every once in a while. I believe you may be confusing robotic cleaners with some other technology. Robots, like the Aquabots and iRobot Verro line are self-contained with their own pump and filter allowing them to simply be plugged into any outdoor grounded outlet. It comes fully equipped and its step-down transformer / power supply allows it to run on just 24V at a little over 1 amp, which is as much as 10 times more energy efficient than pool filter systems and up to 30 time more efficient than cleaners that use booster pumps. This stand alone product type works without installation or draining if the pool. Simply enjoy complete pool cleaning and filtration, including energy, chemical and water savings - at the touch of a button. If it really works then I think it’s a good buy. That is discouraging about the wheel coming off but doesn’t sound like a big issue at least. My next door neighbor has one of these, not sure it’s the exact model you mentioned, but he loves it. Really saves you a lot of time! The best thing about this iRobot pool cleaner is it is an all in one solution that requires no external pumps or hoses. Perfect for a small pool, though I wonder how easy it is to change the filters. The internal filter is a durable, reusable polydacron-type material that has an ultra-fine material on the inside that feels much like a fine felt and an outside that feels like polyester. The filter itself is designed to be a bag having a maximum 34-quarts volume debris holding capacity. It is massive with a lot of surface area to trap fine particulates from algae to pollen to silt to sand. Large debris from pebbles to acorns to spikey burrs to pine needles to palm Levesque are easily trapped and contained within the filter bag. By trapping everything in its internal filter, the pool water is cleaned allowing for less chemicals and the pool’s filtration system to work less. In fact, for every hour the robot works, you may run your pool’s filtration system by one hour less. The in ground jet-driven model offers you the convenience to use an external timer to turn it on/off/on per your schedule, enabling you to operate it up to five to six hours and reduce your pool’s filtration system down to just three to four hours on a low-speed setting (if your pool pump is if the efficient two- or variable-speed type). This can save you as much as 75% off your total energy bills. The internal filter bag has an elastic base that holds it to the plastic ridges along the perimiter of the robots bottom lid. Tjis configuration along with grommet holes ensures that there is always bypass to protect its internal brushless pump motor. The debris inside your filter bag is easily discarded by simply turning the bag inside out (preferably into a garbage receptacle) and the fine dirt can be washed off simply with a hose (high-pressure rinse), by a basic wringing in bucket of water or better yet- a gentle cycle with cold water and no detergents in a washing machine and air drying. Depending on the length of your season (the number of months your pool needs to be maintained), the number of hours you operate your robot and how well you rinse the bag out after each use, you should expect to enjoy full use of the filter bag up to three to seven years. True, but consider the immediate savings that you are able to benefit from long term with the energy, chemical, water and time savings, including the savings from the reduced wear and tear of your pool’s main filtration system equipment and the decrease in filter media as well as the environmental benefits. Perhaps an easier way to truly measure your savings, at least with respect to energy, can be quickly calculated here: www.EnergySavingsCalculator.org. Beyond the convenience of hose-free cleaning and true microfiltration and enhanced circulation, you can calculate just how quickly you will make a full Return On your initial Investment. From that ROI point onwards - you are actually making money. I tried AquaBot’s Turbo, the expensive scrubbing one and it wore out pretty quickly, both motors cooked, tracks wore out, belts wore out, and AquaBot was terrible about their warranty. I got the iRobot unit because I trust them, for good reason, and this one is great. Less complex than the Turbo, only one pump and no motorized treads. Simplicity is usually best, and the pump is very powerful. I am in Phoenix and never had a problem with the power supply shutting down, and we’ve seen 118 for weeks at a time. You do need to do a good job cleaning the filter because the flow depends on the pores being free of algae and DE. When clean the robot makes a pass on our 40K gallon pool in about 15 seconds. When the filter is dirty, about 80 seconds. Along with our Roomba, Scooba, and dirt dog, this is a great unit. Just make sure you don’t coil up the cord too much, it tends to retain any tangles you impose. 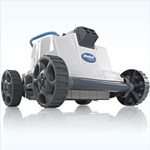 The Aquabot Turbo is the world’s #1 selling robotic pool cleaner. However, as you (Boat Parts) noted, in a pool like yours (aggregate surface, freeform design) located in a climate that sees 118 F degree temps for weeks with the pool requiring year round cleaning and removal of sand and silt, the traditional ‘bot’ robots simply can’t last. There are too many moving parts and the tangible brushes and tracks will abrade away. In the north / Frostbelt, where the pools are open for only about 3, the robots operate for only about a quarter the amount a robot in the Sunbelt would need to. Plus in the north, the majority of pools have a soft vinyl surface and rectangular shape allowing them to last upwards of 10-20 years. For this reason we developed the robotic ‘jet’ technology, so as to provide the best cleaning with leading energy and water efficiency, without any if the wear and tear incurred with every other pool cleaner technology (suction, pressure or ‘bot’ robotic). Manufacturer warranties typically cover only non-wear and tear items as harsh environment conditions such as those found in the Sunbelt are best served by robotic ‘jet’ cleaner technology. Hope this information is helpful. Have a wonderful swimming season. For more information on the different robotic cleaner technologies, please visit irobot.com or Aquabot.com. he best thing about this iRobot pool cleaner is it is an all in one solution that requires no external pumps or hoses. Perfect for a small pool, though I wonder how easy it is to change the filters.